Could do more - especially on the satellite front. At first glance, the Reelbox resembles a high-end multimedia PC. It's large, with an impressive Germanic build quality that goes some way to justify the rather high price. The lower strip of the front panel gives you a row of playback-transport controls, and mobile phone-like 'smart' buttons that intelligently change their function according to what's displayed on the large backlit LCD panel located directly above. This screen is impressively detailed, and also displays channel lists and any onscreen menus that may be selected. Sadly, the remote - which is superficially similar to that supplied with its closest competitor, the Dreambox - is still needed to scroll through lists. But there's more to the Reelbox than mere satellite reception, as the various intriguing buttons (PVR and DVD) on the remote suggests. In the centre of the front panel is a DVD-ROM drive that allows the machine to play various types of disc media - one of the reasons for those transport controls. The Reelbox is compatible with DVDs (playback is multi-region), CDs and CD-ROMs or DVD-ROMs containing MP3 music files. But unlike the average cheap DVD player, it spat out our JPEG photo disc. Trying to play DiVX MPEG-4 content - something of which many DVD players are now capable - informed us that the 'appropriate plug-in' is missing. And that hints to the true power of the Reelbox. Like the Dreambox, the machine is based around the flexible open- source Linux operating system. New features can be added by firmware upgrades and application-specific modules (the aforementioned 'plug-ins'). The Reelbox contains far more computing power than most satellite receivers. Buried in its neatly constructed innards are an AMD Geode SC2200 CPU (which contains a 300MHz Intel Pentium MMX-compatible processor, various interfaces and 2D graphics among other things), a 350MHz Pixelworks Equator BSP-15 co-processor for video decoding and 128MB of SDRAM (expandable to 256MB). Taking advantage of all this power is the connectivity, which is superior to just about any satellite receiver on the market. On the rear, you'll find a 10/100Mb/s Ethernet port for hooking up to your home network (an internally fitting Wi-Fi upgrade option is also available). We hoped that such networkability would have facilitated online upgrades à la Dreambox. But with the current firmware the only way of getting a newer version into the unit is somewhat more convoluted. You have to use a PC to burn disc images on to CD-Rs, which are then inserted into the unit. Also on the rear panel are a pair of USB ports (note that upgrading from USB memory devices is currently impossible), coaxial and optical digital audio outputs. Video outputs are particularly impressive. The TV Scart is capable of delivering RGB, component, S-video or composite, plus stereo audio. So too is the VCR Scart, which the rear-panel markings claim will both input and output RGB, component or S-video. This is physically impossible; no wonder the setup menus have no VCR Scart output options! Boosting your video options still further are VGA and component outputs. These are particularly relevant because the Reelbox is ready for hi-def - in both 720p and 1080i forms - thanks to that Equator chip. Reelbox says its product supports Windows Media 9, something that's usually only possible with PCs. An HDMI or DVI output would have been nice, but apparently that's not possible due to licensing issues. A more advanced 'avant garde' version of the Reelbox will include HDMI (an upgrade for the Lite is listed on the German Reelbox site). There is also a 5.1 output, which is redundant unless your AV system lacks a Dolby Digital decoder (DTS isn't supported). It's to be hoped that the Reelbox will justify the expense of such hardware by adding support for multi-channel codecs (like WMA Professional) that most AV amps can't support. There are also lots of interesting front-panel goodies. Behind a solidly made flap reside two CI slots for CAMs, plus a smart card reader - which will come into its own should any enterprising individual produce CAM emulation plug-ins. Also present are USB and FireWire ports for external storage devices and camcorders (two more FireWire ports can be found on the rear panel). Camcorders? Yes, the Reelbox is theoretically capable of recording digital video and audio onto an internal IDE hard disc. Analogue AV is also catered for, courtesy of coaxial/ optical digital audio, phono analogue audio, composite and S-video inputs. But they're not yet supported, although this should change in time. Fortunately, that hard disc (which we had to fit ourselves - our choice was an old 40GB drive that used to live in a Sky Plus box ) can also serve for digital PVR duties. In this respect the Reelbox behaves just like any other full-featured satellite PVR. The Dreambox is built around VDR, which according to importer Visionsat is the world's biggest open-source PVR software. One of the units' most useful features is its Dreambox-like plug-in (thus upgradeable) tuners. Up to two can be incorporated; ours was fitted with two standard DVB-S tuners. But you could, as an alternative, specify one or two DVB-C (cable) or DVB-T (terrestrial digital) tuners. Reelbox is also working on a DVB-S2 tuner card, for reception of modern satellite HDTV channels. To go with this, it plans to introduce an MPEG-4 H.264 decoder plug-in. Combine the latter with a DVB-T tuner card, and those fortunate enough to live near the Crystal Palace transmitter in London should be able to tune into the hi-def terrestrial trials. Even with the standard DVB-S tuners, reception of the BBC-HD Eurobird service should be possible when the MPEG-4 plug-in arrives. The satellite tuners of the Reelbox support DiSEqC 1.2 and USALS (Goto-X) for full compatibility with dish swingers - the simpler DiSEqC 1.0 standard is also catered for. Note that unlike the average satellite receiver, the Reelbox doesn't include a UHF modulator. Occasionally - notably after modifying network settings - our sample hung when saving the changes. The only way out is to turn the machine off from the mains and restart. If you're particularly unlucky, the Reelbox will get stuck in an endless loop near the end of its boot sequence. The only solution is to reload the firmware from CD-ROM. Under these circumstances you have to flip open the cover that hides the DVD-ROM drive's tray to bring the eject button into view. A major issue is that the Reelbox is just not documented properly unless you have a thorough understanding of German. You get a very basic setup guide, but this doesn't explain how to deal with the more advanced features. This should change with time. Setup options are fairly comprehensive, as one might expect from such an advanced product. An installation wizard takes you through the basics: video, language, time zone, fitted tuner types, hard-disc formatting, network setup and channel searches. Manual tweaks are almost inevitable, not least because the wizard tends to be rather forgetful. It repeatedly failed, for example, to remember our DiSEqC configuration. Satellite enthusiasts will find plenty to recognise in these installation menus. The LNBs and any DiSEqC switches are first defined. To install channels with a motorised dish, go to the rotor section. Here, you can select the relevant satellite from a list and choose from a list of the relevant transponders - signal and quality signal bars are provided. The dish can then be moved. The DiSEqC controls are noteworthy. You can vary the number of dish-movement steps and it's also possible to specify the position to which the satellite is stored. Scanning of the current transponder (the parameters of which can be defined) can then proceed. But annoyingly, you can't scan an entire satellite from here; you have to go to the separate channel-scan menu (stupidly placed just above the hard disc format option, this also looks after fixed and DiSEqC-switched installations) and select the bird you're after. Search options are conspicuous by their absence. You can't even tell the Reelbox to scan for only free-to-air channels, so you'll have to delete encrypted ones you don't have the means to view. Blind search, a useful feature that many take for granted, is missing too. All you get is a manual search option, in which polarisation, symbol rate, FEC and frequency can be entered. Network features add possibilities - software developers are, for example, working on PC client software that will allow you to watch Ethernet-delivered TV channels received by the Dreambox tuner. Visionsat told us that such functionality would appeal to schools, because it would, for example, allow different foreign-language channels to be streamed to classrooms. Setting up the networking could be easier; although DHCP is incorporated, the machine kept obtaining the wrong IP address. The Reelbox is capable of joining a Windows network, and we could see the machine on our network with a PC, but the password and username set as defaults in the relevant menu were, alas, refused. Parameters like these have to be entered with the handset. You can't plug in a USB keyboard to enter this and other information - it's not recognised by the Reelbox. A strong point is Reelbox Control Centre (RCC), a freely downloadable but powerful Windows tool. With RCC, you can back up or restore settings (including DiSEqC) or channel databases (which could have originated from a third-party channel). Other RCC features include disc formatting, timer scheduling (SVCR) and telnet (the ability to log into the Reelbox and run Linux commands, using your PC as a terminal). A built-in FTP client, meanwhile, gives you the chance to copy PVR recordings to your PC for disc authoring. The recordings take the form of programme streams which also contain other metadata. We found an excellent freeware Java applet (ProjectX) that will extract just the audio and video content of these program streams, and save them as separate m2v (MPEG-2 video) and mp2 (MPEG-1, Layer 2 audio) files. These can then be multiplexed with a program like TMPG, and the single file thus created burnt to a DVD with your favourite authoring software. Because you're effectively authoring these DVDs directly from the off -air MPEG streams, they look and sound just as good as the original broadcasts. Sometimes, we had to keep switching between tuners during the install mode to get any kind of workable signal from our dish. The same trouble also cropped up sometimes when watching channels; we hope this is a sample fault. In addition, the scanning mode would not find all of a satellite's channels in one go, and so we had to repeat the procedure, often several times. Some channels, like the BBC bouquet on 28.2°E (10.773GHz/H), could not even be found with a manual scan. Another disappointment is the lack of channel organisation. The single channel list is expected to cover all radio and TV channels on all satellites, and as a result makes access to a specific channel unnecessarily long-winded. Even the cheapest FTA receiver will group channels by satellite, provider or name. Not even favourites lists are supported - there's a 'preferred channels' menu-option, but it's unfathomable without documentation - and channels you don't want (non-FTA channels, for example) have to be removed individually. About the only good thing that can be said about the Reelbox list is that it's easy to edit the parameters of the highlighted channel - great for radio services that regularly change their PIDs. Manually creating a channel by laboriously modifying an existing one's data is also allowed, and that's how we managed to get BBCs Three, Four and News 24 in the end. An alternative would be to update the channel list from the Internet via RCC but this, of course, means you're relying on the efforts of others. Visionsat told us that a long-term fix is on the way. An intriguing prospect is the 'mediacenter', which has its own entry in the receiver's main menu. From here, you can initiate replay of DVDs, CDs, VideoCDs and MP3 tracks. 'Write DVDs' is another option - strange, considering that the Reelbox doesn't incorporate a DVD burner. Related to this is 'DVDSwitch', which seems to copy (unprotected) discs to the hard drive as image files for near-instantaneous viewing and burning. Our attempt to copy a self-made DVD caused the Reelbox to crash. One can assume that some kind of upgrade is on the way. What a pity you cannot yet copy MP3 or audio CD tracks to the hard disc. Still on the subject of recording, the Reelbox's PVR functionality is, on the whole, excellent. Hold down the record button to start manual recording - if you press play, the recording in progress can be viewed from the start. Various chasing-playback tricks, like searching and pause, are available here. Chasing-playback can also be initiated by pressing the pause button; doing so creates a timeshift buffer that, alas, can't be stored permanently on the hard disc should you decide the contents are worth keeping. Thanks to the dual tuners, you can simultaneously record and/or view two different channels. The seven-day EPG (which also supports the tvtv web service) is listed in the main menu - a dedicated remote button would have been friendlier. At least the EPG is capable of scheduling recordings. The timer - the capacity of which appears to be limited only by available hard disc space - can also be manually programmed. Recordings, like the channels, are displayed in a long list with no means of organisation provided. However, the recordings are automatically named from EPG data. No true editing functionality (like partial-delete) has yet been implemented. The user interface also tends to be rather unresponsive, and it's too easy to overshoot when selecting a channel or menu option, so selecting MP3 tracks from a CD-ROM or DVD-ROM can be a thankless task. But there are compensations. CD track and album names are displayed on the screen and front-panel display, the information being derived from the internet. The Reelbox has an onboard teletext which will quickly access the desired page. Picture quality is excellent, whether you're using RGB Scart or component. 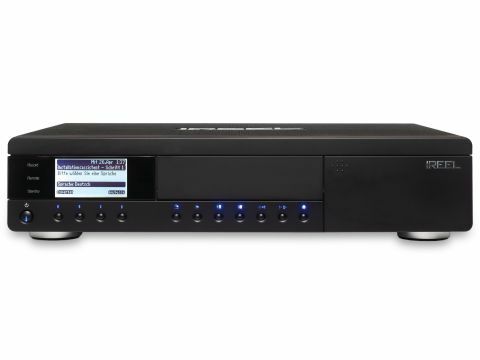 Few receivers are as good as this, regardless of price. Sound also impresses, with a lively, full- bodied character that does equal justice to satellite radio broadcasts and TV channels. Even CDs fared well. But DVD playback was erratic, 'error fetching data' messages frequently being reported. This is possibly because the machine runs far too hot; DVDs are uncomfortable to remove from the disc tray. To make their product run as quietly as possible, Reel Multimedia has neglected to include a cooling fan. Seriously negligent, in our view, as the long-term reliability of the unit (and any discs you forget to remove from it) will be affected. As far as scanning performance is concerned, the Reelbox took 2.5 minutes to scan its 72 preset Astra 1x (19.2°E) transponders. This may sound impressive, but bear in mind that several tries may be needed to find all available services. It's potentially powerful, but in its current state the Reelbox can only be recommended to experimenters. Like the Dreambox, it may be a work in progress, but the product should not yet be released as a consumer product until essential features are included and their reliability proved. Current firmware is far too buggy, and features that you'll find on sub-£100 entry-level receivers (like FTA-only searches) are missing. Documentation is inadequate, and you're paying for hardware - the analogue AV inputs and FireWire ports - that has not yet been enabled, which is a pity. The AV performance of the Reelbox is first-rate, as is the PVR functionality.